The not-so-secret 2015 Polaris Slingshot has a steering wheel and bucket seats. So we shouldn’t even be reviewing it, right? I kinda felt that way when given the assignment. In hindsight, though, I’m glad I had the opportunity. 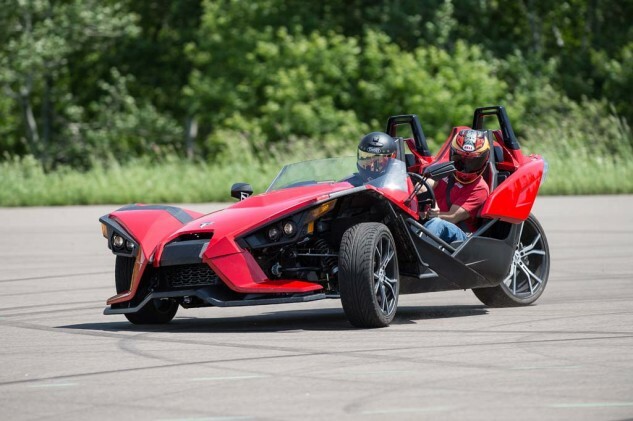 The Slingshot’s an absolute blast, and at $19,999 for the base model, it’s gonna give Can-Am’s Spyder ($18,999 for the ST) some stiff competition. Discuss this at our Polaris Slingshot Forum. It’s not just the Slingshot’s price that’ll lure owners, or possible owners, of Spyders away from Can-Am dealerships and into Polaris ones. There’s some crucial performance advantages of the Slingshot, specifically in the claimed 173 crank horsepower at 6200 rpm and 166 ft-lbs. of torque at 4700 rpm emanating from its 2,384cc inline-Four Ecotec engine. 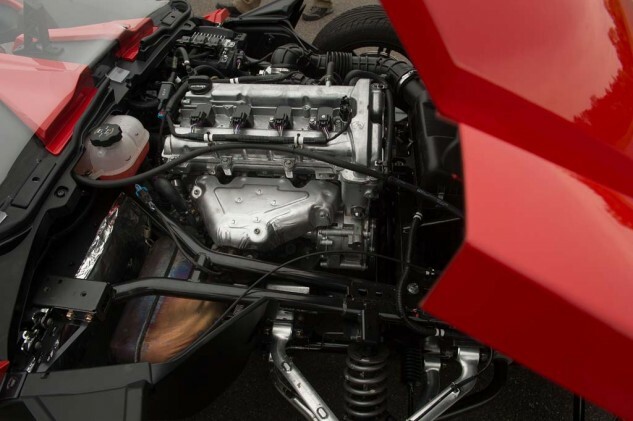 Can-Am claims 115 hp at 7250 rpm and 96 ft-lbs at 5000 rpm from the 1,330cc Rotax Triple powering the ST. At a claimed 1,725 pounds full of fluids, the Slingshot weighs substantially more than the RT’s approximate wet weight of 1,100 pounds, but the extra weight of the Slingshot is negligible when it comes to having fun. The key to the Slingshot’s grin factor is its combination of low CoG and the superbly defined algorithms upon which its sophisticated electronic rider aids operate. With supercar-like ground clearance of only five inches, the Slingshot tenaciously clings to asphalt with all three of its wheels. At least it did during the legal speeds of our road test and in the unrestricted environment of Polaris’ cul-de-sac test track. Resembling a giant lollipop, we inhaled the tire smoke of first gear burnouts, and managed second and third gear chirps down the track’s short straight (with TC on). In the big circle of the lollipop we tried everything we could to overwhelm the Slingshot, but its bevy of electronic aids (ABS, traction control [TC], electronic stability program [ESP]) managed to balance fun with safety and control. Stripped of its bodywork, it’s easy to see the minimal amount of space between arse and pavement. The top of the roll bars (which can support 5-times the vehicle’s weight) measures 51.9 inches from tarmac. The spaceframe is constructed from high-strength steel. The 9.8-gallon fuel tank resides behind the driver’s seat. It is here, with the electronics, where we can draw a significant difference between the workings of the Slingshot and the Spyder. Like an overprotective parent, the Spyder’s Vehicle Stability System (the same combination of ABS, TC and electronic stability) promptly retards enjoyment as soon as the fun really gets going. While you can get the rear wheel spinning in a straight line on the manual-clutch versions of the Spyder, the vehicle’s electronics, in the name of safety, kick in at a much lower threshold compared to the algorithms Polaris has produced. The Slingshot, on the other hand, with its electronics in play, allows a greater amount of rear-wheel spin compared to the Spyder, and enough cornering force to get the front tires squealing. Like the Spyder, the Slingshot’s ESP maintains a level plane (you’re not gonna lift a front wheel or flip the vehicle) but turn the steering wheel hard enough and you’ll hear the front tires howling in protest. The Slingshot’s electronics make you a better driver without actually improving your skills. More excitement can be found by simply switching off the electronics with a push of a button. Without a real track, or even the twisty canyon roads of our normal testing grounds in SoCal, we can’t say unequivocally that the Slingshot is gonna make Arial Atom owners run and hide, but initial impressions are favorable, and the Slingshot costs half the price of an Atom. Polaris reps said at the press launch that media models will be available soon, so hopefully we’ll be able to get a Slingshot and Spyder to compare and contrast on equal footing. 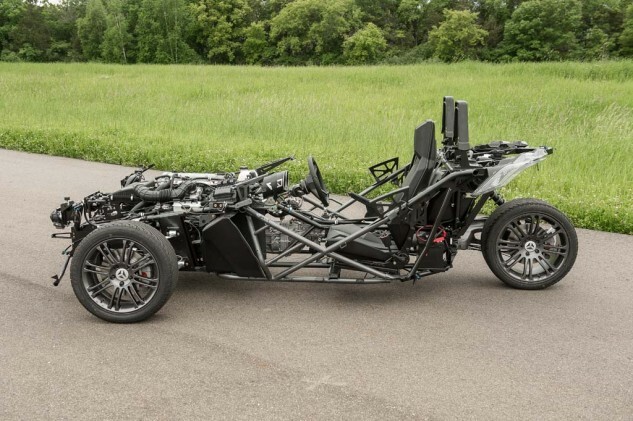 As for the Atom … it has four wheels so we’ll let our sister site, Autoguide.com, make that comparison. The Slingshot will be available in two variations: the standard version ($19,999) and the SL ($23,999). Some key differences between the two are wheels sizes 17- and 18-inch, front and rear, respectively, on the standard, while the SL sports a larger 18- and 20-inch, front and rear, combo. Those larger wheels on the SL are also forged aluminum, 10-spoke jobs, where the standard receives cast, 8-spoke hoops. The SL also comes equipped with a media console that features a 4.3-inch LCD screen with a rearward camera, USB input and Bluetooth integration, and a six-speaker audio system. The Blade windshield is also standard equipment, but there’s a cool, Batmobile-esque double-bubble windshield available (we’re told this windshield doesn’t provide the quiet pocket of air as the Blade windshield). The audio/video interface is simple but efficient. The fit and finish of the pre-production models we drove was a little sub-par, but we were assured that consumer versions will be up to the quality standards you’d expect of a Polaris product. Beyond these luxuries, the standard and SL models are identical twins distinguishable mostly by their paint schemes; Slingshot Red Pearl for the SL, while the standard model gets Titanium Metallic. 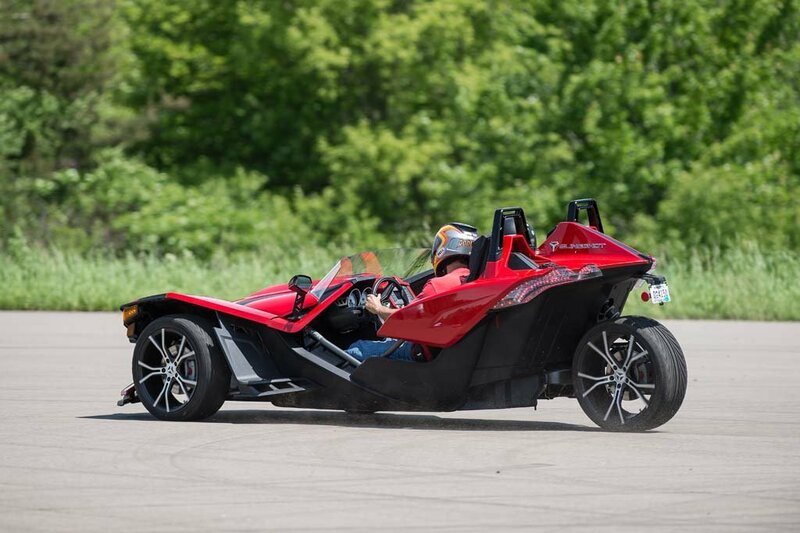 As mentioned above, and obvious by its appearance, the Slingshot is sporty. Inside the cockpit you’ll notice short, fluid throws from both the foot clutch and manual five-speed transmission. Steering is made easy by way of electronic power assist. Acceleration from the Ecotec engine’s abundant amount of torque is brisk. You move through the first three shorter gears in rapid procession, utilizing the taller 4th and 5th cogs for freeway cruising. Not as attractive as the exposed V-Twin powering the Morgan three-wheeler but a helluva lot more powerful is the DOHC, 2.4-liter, GM Ecotec engine. Entry is gained via a reverse-tilting hood. Polaris estimates a 26-mpg average. Besides the SL’s LCD screen, instrumentation is kept to a minimum with a large, white-faced analog speedo and tach. An optional smartphone mount is available. The Blade windscreen does an impressive job of diverting wind over the driver and passenger, keeping wind noise low enough for casual conversation even while wearing full-face helmets. The seats are adjustable fore and aft, while the backrest tilts a few degrees (similar to coach airline seating), as does the steering wheel. Folks above six-feet in height may get somewhat cramped. Behind both seats you’ll find a lockable compartment large enough to fit a full-face helmet. There’s also a lockable glovebox, but that’s it when it comes to storage space. The rear wheel is attached to a single-side swingarm. Front and rear suspenders are of the non-adjustable, “sport-tuned” variety. Tail lights are LED. 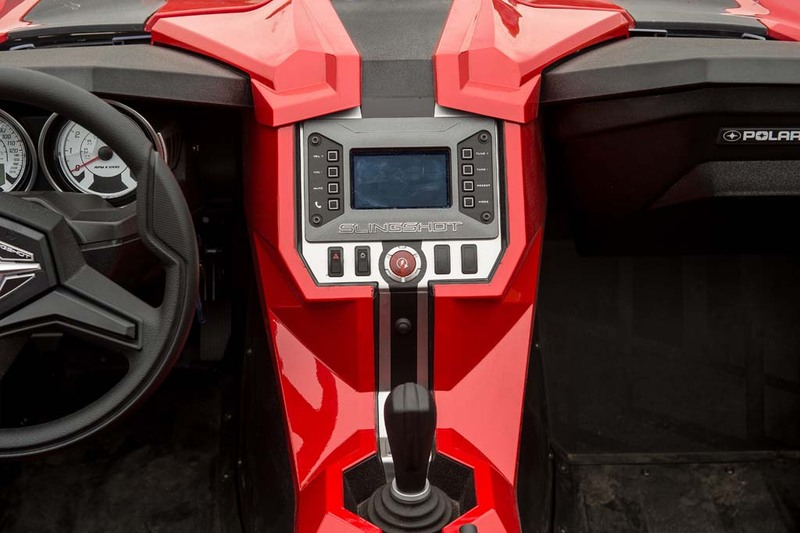 The open-air, no-doors cockpit gives the Slingshot a motorcycle-like immersion into your surroundings – seeing, hearing and smelling things you’d otherwise miss inside a regular sports coupe. Like a motorcycle, all the switchgear, instruments, seats, etc., are weatherproof, and the body panels are molded from a polymer compound that’s been tested for numerous hours and said not to fade over time from exposure to direct sunlight. Using the success of Can-Am’s Spyder as a guide, it’s probable the new Slingshot will be a homerun for Polaris – a company that’s been batting 1000 with its recent acquisition/relaunch of Indian motorcycles as well as its side-by-sides and ATV models. 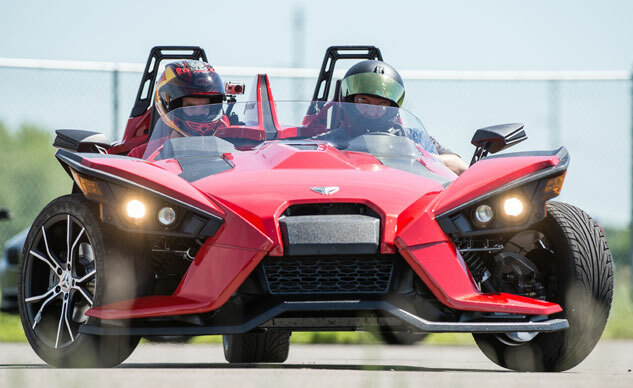 Consumer greenbacks are the final measuring stick, but Polaris dealers with a Slingshot in their front window should prepare for an influx of foot traffic.